In the past, many cultures considered meat a luxury that could only be enjoyed on special occasions or certain days of the week, while today it is a staple that can be found in nearly all restaurants and many kitchens all over the world. The market value of the processed meat is expected to rise from 714 billion U.S. dollars in 2016 to over 1.5 trillion dollars by 2022. Poultry is the most popular kind of processed meat, with a 38 percent share of the global market. Red meat, which includes pork and beef, takes up about a 33 percent share. However, seafood, often considered healthier and more environmentally friendly than other meats, saw a higher compound annual growth rate than both red meat and poultry. In 2017, the United States saw the highest revenue from meat products and sausages, nearly twice as much as the second largest meat market in the world, China. As the demand for meat rises worldwide, so must the production of meat. Most of the world’s meat is produced in Asia, which generated 140 million metric tons of meat in 2016. Pork and poultry are the most widely produced types of meat, with sheep being the least produced. Although many people abstain from pork for nutritional or religious reasons, pork is widely consumed and produced in China and Europe. Some of the largest meat production companies in the world include Tyson, Hormel Foods, and National Beef. In addition to producing the highest revenue from meat sales, the United States is also a major producer and exporter of meat, especially beef. The trade value of the U.S. beef industry amounted to about 6.2 billion U.S. dollars in 2017. Brazil is also a major exporter of meat, both in the form of broiler chickens and beef. 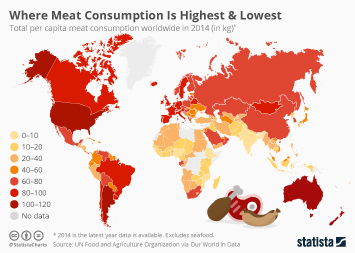 The projected per capita meat consumption is expected to remain steady at around 35 kilograms of meat per year. However, as the global population continues to climb, the overall consumption of meat is expected to rise steadily in the upcoming years. However, perhaps because of environmental or health reasons, red meat is expected to see a decline in consumption in the United States in the coming years. Topic: Organic farming in the U.S.
Topic: Beef market in the U.S.